Camelot drives its cart to the Wii. Japanese developer Camelot is no slouch on the golf course. In the last few years, the team has worked on Mario golf games for Nintendo and on the Everybody's Golf series for Sony. Now Camelot is teaming up with Capcom for a new golf game for the Wii. We Love Golf! 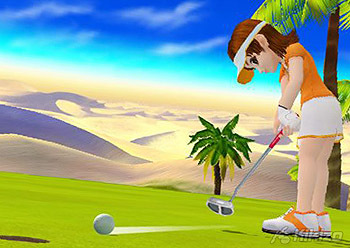 is described by Capcom as a "realistic golfing experience" that has been dressed up by incorporating Wii remote controls. From the sounds of it, it seems that Camelot is going for something closer to real golf than Nintendo's golf mini-game in the pack-in phenomenon Wii Sports, though the company has been somewhat cagey with specifics. You'll be able to play alone or with up to three other players on an unspecified number of courses. The requisite player customisation feature omnipresent in golf games will also make it into this one, allowing you to pretty up your cutesy player as you please. We Love Golf! is coming only to the Wii and will be out sometime next year.